Salt Beer Factory is a £1.7m investment by Ossett Brewery housed in a Grade II Victorian tramshed built in 1904. The development, nestled in the heart of the UNESCO World Heritage village of Saltaire, is a micro-brewery with a difference, unifying heritage and modern brewing. The mission is to produce showstopping, hop-forward beers and couple them with an interactive brewery experience. Brewing a wide range of beer in keg, can and cask formats – including IPA’s, NEIPA’s, Stouts and Lagers – an exciting line up of brewing collaborations are planned for the 2019. The 20-hectolitre beer factory is housed in an iconic piece of unique architecture. The taproom sits in the heart of the brewery, where beer-drinkers can enjoy hand-crafted SALT Beers with the backdrop and theatre of the brewhouse around them. 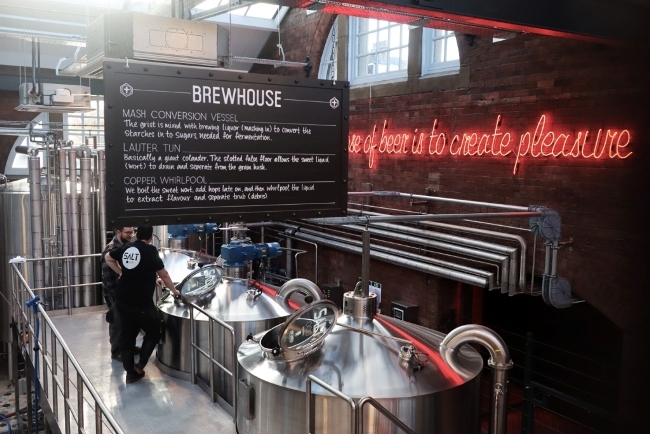 The Salt experience includes brewery tours, a stage for live events, DJ booth, viewing mezzanines, tank beer dispense, gift shop, wood-fired pizza oven, and private hire/conference facilities. A range of clothing has been specially designed for Salt by the global fashion brand Luke 1977. The brand doesn’t stop there; work is underway for the expansion of Salt through two craft-centred venues, named Craft Asylum. The first bar is set to launch in the venue formerly known as, Candlebar in Granary Wharf, Leeds, on Friday 16th November. The second Craft Asylum, at 26 East Parade, Leeds, just off Greek Street, will be opening its doors on Friday 30th November. Jamie Lawson, owner of Ossett Brewery, said: “The vision for Salt has been three years in the making; a concept that began with an idea to brew some beer at the back of the Hop in Saltaire has now evolved into something much greater than we could’ve ever imagined.